The new 5558 Professional 4.0 self-inking stamp numberer has an impression size of 56 x 32mm. 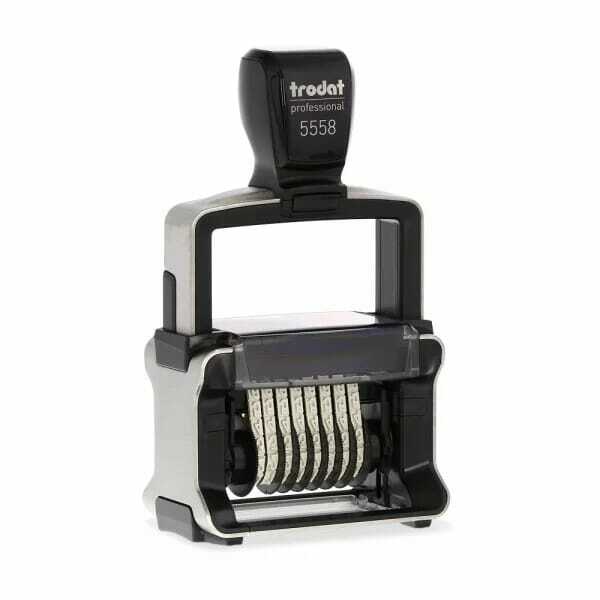 Trodat's self-inking numberer features a new brushed stainless steel finish giving it a professional look while ensuring durability for heavy use. The 5558 has 8 bands with a character height of 5mm with each one containing digits 0 to 9, plus additional characters including #, %, € and many more on the first band for further versatility of the stamp. Customer evaluation for "Trodat Professional Numberer 5558"